The CBC reached 86 per cent of the Canadian population with its broadcasts of the World Cup – but not everyone was watching it on TV. To capture a fragmented audience watching games on smartphones, tablets, and the web, CBC tapped Adobe Analytics to get a real-time picture of where and how its audience was tuning in – and it had the ability to change programming on the fly as a result. While millions of Canadians were glued to CBC’s streamed video coverage of the Sochi Olympics and FIFA World Cup this year, the broadcaster’s manager of digital research Greg Dinsmore had his eyes trained on them. With the help of Adobe Analytics, Dinsmore was able to watch the watchers. He got a comprehensive dashboard view of how Canadians consumed CBC’s digital coverage of both global events, across multiple devices, in near real-time. In fact, Adobe Analytics’ video heartbeat feature can provide viewership metrics from a video every 10 seconds while it’s being played. Data generated from each video includes how many people watched it, how many watched it until the end, the number of abandoned viewings, the point at which they stopped watching and what kind of device they viewed it on. That last metric – device type – is key today as content is increasingly consumed on devices other than TVs, says JD Nyland, director of product management at Adobe Analytics. He cites in-house Adobe research indicating that 71 per cent of online video and TV content is now consumed on Android or iOS devices. CBC’s own figures seem to lend credence to this trend. 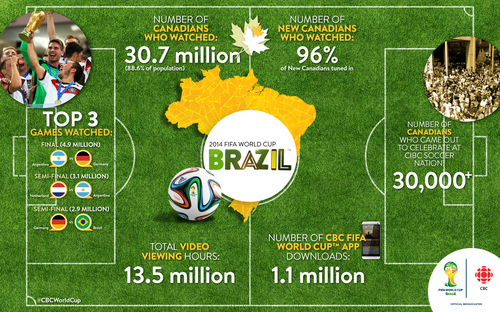 Viewership of its 2014 World Cup video content on non-TV platforms jumped by 51 per cent compared with the 2010 tournament. Almost 14 million hours of CBC’s streamed Sochi content was consumed online, nearly doubling online viewership from the 2010 Vancouver Olympics. By measuring viewing patterns more accurately, analytics allows broadcasters to tailor the type, scheduling and distribution of content more effectively to audience demand, Nyland says. “This will allow (content) publishers and broadcasters to deliver content to users on the right device at the right time that will keep them engaged,” says Nyland. That applies to digital advertising content as well, he adds. While a video is still streaming live, both advertisers and content providers can switch gears to tailor or change their content based on the analytics data they receive in almost real time, he explains. Dinsmore doesn’t disclose whether CBC changed any live Olympic or World Cup coverage based on analytics data, but says the information was there for producers if they wanted it. That “first look” at big data allows sports broadcasters to adopt a predictive strategy: if a certain event or player boosts video consumption, they can highlight them again in current or future programming. Beyond predictive programming lies personalization. Rather than tailoring content to fit overall viewing patterns, broadcasters can push out content that uniquely fits each individual. “We allow customers to take that data and use it to then drive action, like target other visitors that look like the ones coming or provide personalized experiences,” says Nyland. Analytics is no magic bullet for digital content producers and advertisers. Dinsmore says analytics was just one tool used in conjunction with social media monitoring and traditional TV ratings to paint as complete a picture as possible of CBC’s audience during Sochi and World Cup 2014. Broadcasters must also adjust their data analysis based on demographics, timing and platform, says Adrien Mak, a consulting and deals partner in the systems integration and information management unit at PricewaterhouseCoopers in Toronto. A new partnership may help plug some of those data holes. Next year, Adobe and Neilsen will launch what they call the “first comprehensive, cross-platform system for measuring online TV, video and other digital content across the web and apps.” It aims to standardize analytics collected from desktops, smartphones, tablets, game consoles and over-the-top boxes. Back at CBC, Dinsmore points out that the public broadcaster isn’t new to big data. It formerly ran its own in-house analytics program that generated data on live streaming video content every two minutes. But it put a lot of stress on CBC’s server load, making it costly and complex to run. Switching to Adobe’s cloud-based solution cut CBC’s implementation and server costs by about 10 per cent. 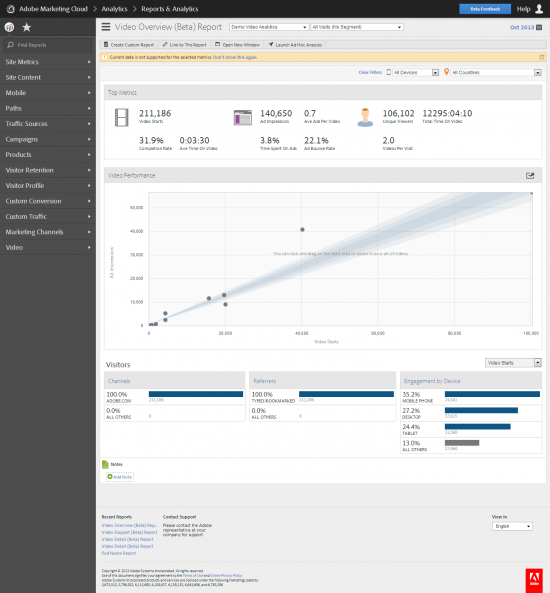 Analytics can process more data faster than ever before. As big data gets even bigger, however, Dinsmore warns users to focus on data that’s relevant to their business – and tune out the rest. In other words keep your eye on the ball — or in this case — your audience.